Mental health issues can be hard for children to understand. We can’t always see if someone is mentally healthy or unhealthy, but understanding that mental health issues are very real health concerns can help us support loved ones who struggle with them. Understanding mental health issues can also give us the courage to speak up when we don’t feel as well as we could. ​This illuminating and humorous cartoon is designed to encourage thinking and discussions about how to support people with mental health challenges. Rocketoons Episode 9: Marv or Myth - Talking About Mental Health can start Cartoonversations to help kids talk about how mental health issues are very real and what we can do to be good listeners and friends. As our mythical creatures point out to us, they are very real – and so are mental health issues. We can’t see mental illness the way we see other illnesses, so we have to be on the lookout to make sure friends and family (and ourselves) get the right support to be mentally healthy. Rocketoons are FREE for everyone. There is no membership or subscription required and no password to remember. Rocketoons encourage kids to think and talk about essential life skills and social-emotional learning topics. Episode 8 - Resilience uses tardigrades - the world's most resilient creatures - to help kids understand the importance of a growth mindset. This engaging and inspiring cartoon is designed to encourage thinking and discussions about what to do when things don't go our way. Mindfulness, gratitude, and asking for help are just a few of the ideas brought up in this animated video to help kids learn how to navigate through adversity. Watch Rocketoons Episode 8: Making the Grade - Resilience and use the Rocketoons Cartoonversation™ Card to help your kids discover the many ways they can build resilience and succeed. Resilience. When something doesn't go well, we need to be able to bounce back - to get back on track. That isn't always easy. In fact, sometimes it feels impossible. We all need to work on being more resilient, and we all need to know that it's okay to ask for help. Join our tardigrades, nature's most resilient creature, to learn a few secrets about how to get back on our feet when things don't go our way. Rocketoons are FREE and available for everyone. There is no subscription, password, or membership required. We don't take any personal information! It might sound like great fun to skip school, until you realize the damaging consequences. Truancy, which is any unexcused absence from school, causes kids to fall behind in school, and falling behind can lead to low self-esteem and depression. Kids who skip school regularly are more likely to experiment with drugs, drop out and not graduate, and get in other kinds of trouble. Episode 7: Hop, Skip, and a Jump - Truancy is an award-winning and fact-packed animated cartoon designed to encourage thinking and discussions about the troubles caused by skipping school. Watch the cartoon and use the Rocketoons Cartoonversation™ Card to help your kids talk about how skipping school puts them on a dangerous and challenging path. 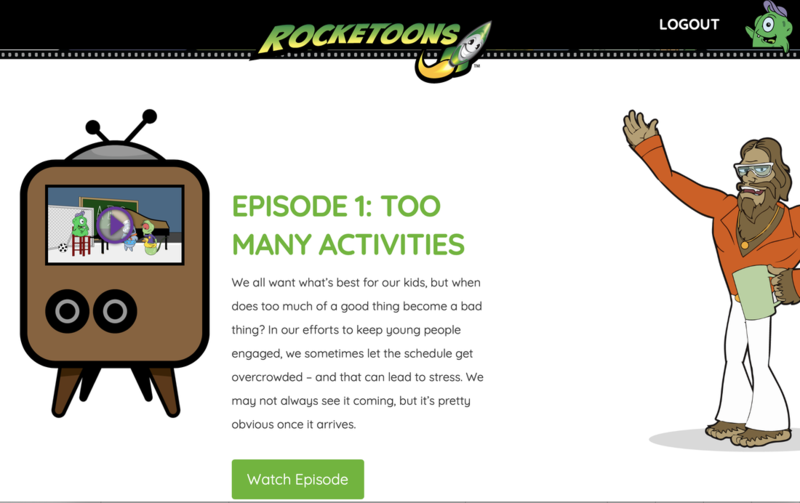 For help getting started refer to our step-by-step guide "Getting Started With Rocketoons." Rocketoons are free - there are no passwords, memberships, or subscriptions! Let's all play Hop, Skip, and a Jump, the game show that proves truancy is never a good idea. Join our contestants as they match wits (or try to) with show host Flynn Valentine. All of our contestants are skippers, one way or another, and it shows when they try to keep up with the questions. From low self-esteem to losing your driver's license, skipping school never leads to anything good - and it certainly can lead to something bad. Have some fun with our contestants, but pay careful attention to the facts and figures. You will hear everything you need to know about staying in school and avoiding the pitfalls of truancy. It feels terrible to be cyberbullied, but have you ever considered what cyberbullying does to the cyberbully? There are many victims in the cyberbullying cycle, and when kids understand the many different and harmful sides to this form of bullying, they can help stop it. ​This award-winning and inspiring cartoon is designed to encourage thinking and discussions about the ways that cyberbullying hurts and how cyber bullies get hurt, too. Watch Rocketoons Episode 6: Think Tank - Cyber Bullying to help kids students talk about the different ways cyber bullying is hurtful and how we all need to work to stop cyberbullying. Rocketoons are free for everyone to use. Refer to our "Getting Started With Rocketoons" guide for help getting started. Have you ever been cyber bullied? Do you know what can happen to a cyber bully? This growing problem needs your help, and everyone at the Think Tank is counting on you to put an end to cyber bullying. Join Archie and the rest of the undercover (and sometimes underwater) agents to learn about cyber bullying and how it can harm so many people - including the cyber bully! It Hurts To Be Left Out. At some point or other, virtually all of us will have a moment when we are not the first one picked. Most of us will also know what it feels like to be the last one picked. How we deal with that disappointment, and how we learn how to deal with it in the future, can have long-lasting consequences on our health and our happiness. The good news? A little effort can go a long way to building healthy self-esteem and to helping others. This award-winning and engaging cartoon about two pumpkins in a pumpkin patch encourages thinking and discussions about how to deal with disappointment and low self-esteem while touching on the ideas of diversity and inclusion. It stings to be the last one picked, but with the help of our friends, Charlie and Stella, we can learn to apply a growth mindset and positive thinking to help us feel included and to include others. Watch Rocketoons Episode 5: Last One Picked to help your kids talk about dealing with disappointment and times when they don't feel good about themselves. We all have those moments when we don’t feel so good about who we are. Unfortunately for Charlie, he has those moments a little too often. Fortunately for Charlie, he also has Stella – the kind of friend who can make him realize the value of finding the positive and enjoying the moment. Social media can help us stay in touch with our friends and our families, and we can meet people who have the same interests and hobbies that we have. But no matter how fast you think you are, you’re never fast enough to control what happens with social media. The online world is a vast and complex place, and nearly everyone is in it. Over 90% of teens have used some form of social media, and 75% have a profile on at least one social networking site. Don’t let your kids blindly enter this complex and potentially dangerous space. Join our friends at the track as they try to keep up with the lightning fast world of social media. Have a few laughs and learn a few facts to help start the Cartoonversation™ with your kids. 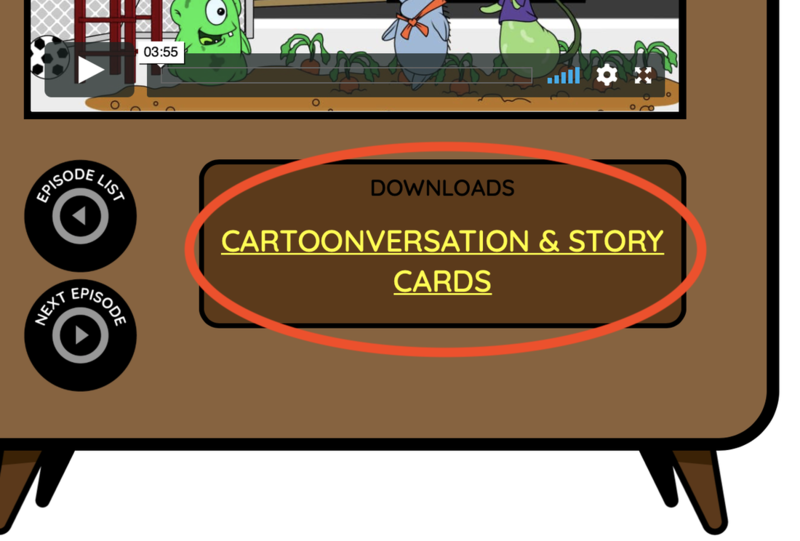 Use the Cartoonversation™ Card to find out more about what the kids know and what they think they know. Enjoy Rocketoons and enjoy those wonderful kids! 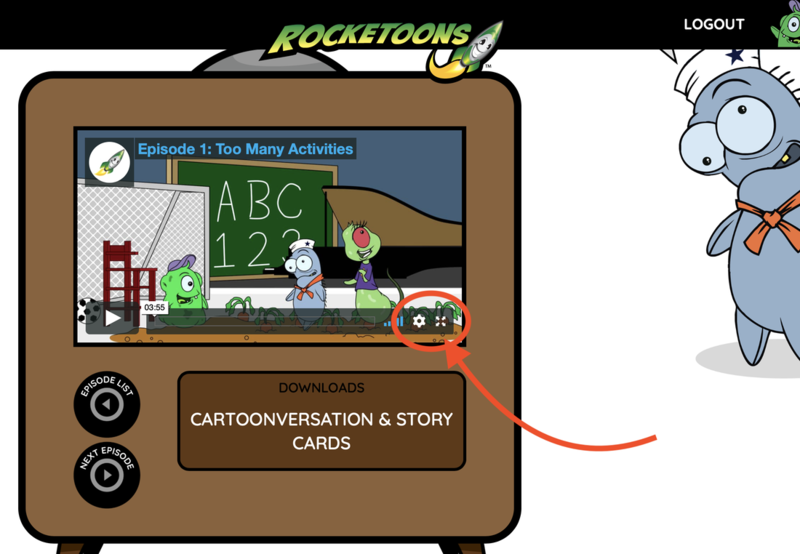 For help getting started with Rocketoons - download our handy guide. In fact, many bullies don't even like being a bully. So what can we do to take bullying out of the picture? Like most subjects, the more we know, the more we can do. Winner of FOUR animation and education awards, Rocketoons Episode 3 - BULLYVISION is a thought-provoking cartoon designed to encourage thinking and discussions on the different forms of bullying, bullies, and solutions to end bullying. Watch Rocketoons Episode 3: Bullyvision to help your kids discover the different forms bullying can take and what they can do to help stop it. Our three friends may live in the tiny world of a microscope slide, but they have a good understanding of what bullying is. They can tell us about four different types of bullying, and they can help us start this crucial conversation. They have even brought in some familiar looking friends to help tell the story. Rocketoons Episode 2- Moving to a New School can help you start a Cartoonversation with your kids (or students) about the challenges and stress they face when their family moves into a different school district. This cartoon can help you guide your kids toward positive thinking and the new opportunities ahead. Teachers appreciate using this animated conversation kit to encourage empathy and understanding when introducing a new student to the class. Winner of two national awards, this thoughtful cartoon is designed to encourage thinking and discussions about being the new kid in class, moving to a new school, and how to welcome new friends. Watch Rocketoons Episode 2: Moving to a New School and use the Rocketoons Cartoonversation™ Card to help your students discover the challenge and adventure of trying something new. What is it like to move to a new school? Exciting? Scary? Fun? Difficult? For most kids who go through a move, it's all of the above. Moving is a lot of work for adults and for kids, and starting a new school filled with new people can be overwhelming. Fortunately, our microscopic friends have a few ideas for making the move more fun and exciting - and less scary and stressful. Chances are good that there are kids in the classroom today who have made this move, and there are more kids who will be experiencing a change of scenery somewhere down the road. 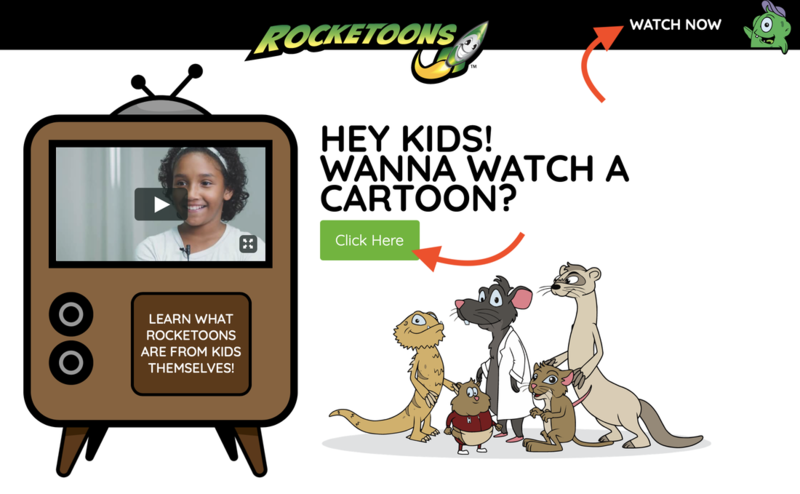 To Get Started on Rocketoons - download our step-by-step guide. Logging in to Rocketoons couldn’t be easier! Three simple steps to get started. All 15 episodes are listed in order. Just scroll to the episode you want to watch. Click the play icon in the cartoon screen window to start the cartoon. 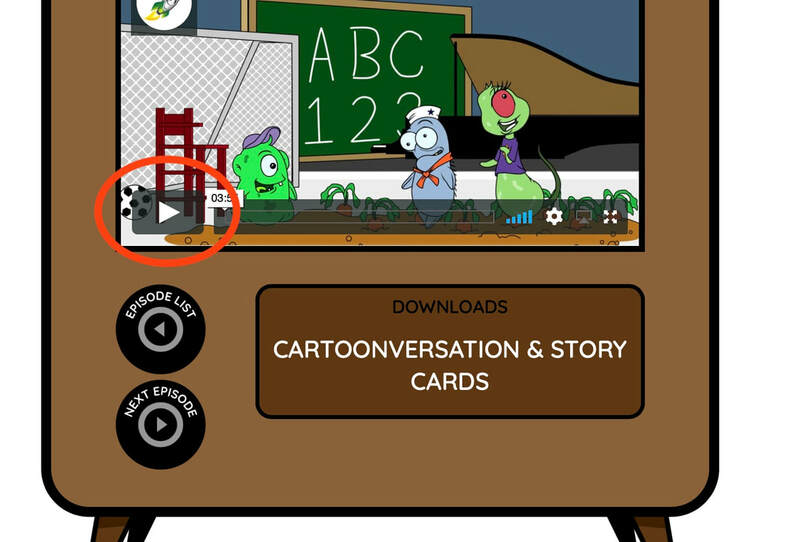 The bottom right icons allow you to adjust the video quality and make the cartoon full-screen. Don’t Forget the Cartoonversation™ Card! Each episode comes with a Story Card and Cartoonversation™ Card with starter questions, factoids, and additional online resources. Children need more sleep than adults. Sleep supports their rapid development - both physical and mental. It can be hard to tell if your child is getting enough sleep because tired children don’t slow down the same way adults do. Sometimes they wind up. You may have experienced the hyperactivity associated with overly tired kids. It often looks like ADHD. Certain conditions may affect a child’s ability to sleep. Always check with your pediatrician if you suspect your child is not getting enough sleep. Get worries out of your head by writing them down - including your to-do list, fears, or worries. Also write a gratitude list, where you witnessed kindness and courage throughout the day. Do not use the TV or a mobile device to soothe a child. Let them learn to calm down on their own. Reading can help. And to talk with your kids about sleep watch Episode 1 - Too Many Activities. Download the Getting Started with Rocketoons Guide, for step-by-step instructions for getting started on Rocketoons today.